Enerpac (A Division of Actuant Corp) , will this year introduce advanced heavy lifting, precision bolting and safety and efficiency-focused maintenance and integrated solutions and capabilities at the Queensland Mining Exhibition, QME, in Makay from 27-29 July. On a global scale, Enerpac’s projects range from lifting of entire buildings and bridges (including the Golden Gate Bridge in San Francisco) to splitting of mining draglines for maintenance and the hoisting of grinding mills in Australia. Enerpac will introduce new expertise and technologies to Australia to handle demanding industrial and infrastructure projects that require a combination of world-class expertise, technology and design. Specialist staff from Enerpac will be available at QME to discuss the advanced technologies on show at QME and those employed in recent major projects. This includes use of PLC controlled Enerpac synchronous lifting systems and strand lift systems being used to lift a dozen grinding mills in Western Australia. Synchronous technology has also been used in Australia to enhance precision and safety during vital stages of the ongoing $A1.2 billion expansion of the Dalrymple Bay Coal Terminal near Mackay. Synchronous technology has also been deployed in Victoria to enhance safety and precision to hoist a 2,200 ton load during maintenance of a huge dredger at the Loy Yang coal mine. At QME, Enerpac will also showcase their new-generation 700 bar hydraulic technology that is lighter, quieter, safer, more powerful and more efficient in use. A comprehensive range of high-pressure (700 bar) hydraulic lifting equipment, which packs more lifting power into a smaller space and makes cylinder placement simpler and safer. Stock lifting capacities range from a few hundred kilograms to individual cylinders that can lift up to 1,000 tons each. Cylinder ranges include steel, aluminium and special corrosion-resistant types. Enerpac Industrial Grade Lifting Bags and controls, for lifting, pushing, pressing or moving loads safely and smoothly. Enerpac offers nine sizes of Lifting Bags with load capacities ranging from 3- 74 US ton (27-656 kN) using up to 116 psi (8 bar) compressed air. The uniquely designed Lifting Bags feature the highest friction surface available, providing increased safety. A new system of plastic cribbing blocks and wedges introduced by Enerpac to optimise safety when stabilising heavy loads after they have been lifted. Developed as a more stable, longer-lasting and easily cleaned alternative to wooden blocks, the blocks feature an aggressively patterned slip-resistant pyramid locking surface for superior stability in cribbing, chocking and shoring. New generation pumping equipment, including low-maintenance, energy-saving Z series engineered to save time and labour on repetitive tasks while improving operator safety with comprehensive valving and customising options. A comprehensive family of professional bolting technology all available from one source, with tools designed to streamline many of Australasian industry’s most common, time-consuming and potentially hazardous maintenance and fabrication tasks. 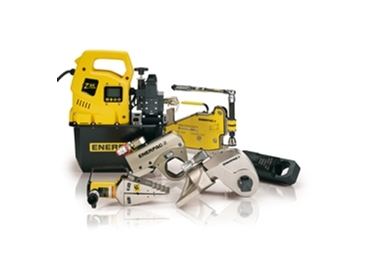 From joint assembly and controlled tightening, through to joint separation, Enerpac’s bolting tools and accessories offer the solution best-suited to the project. The Enerpac family of precision bolting tools includes hydraulic torque wrenches and torque wrench pumps, nut splitters, flange spreaders and alignment tools engineered to complete the most difficult bolting jobs with the degree of safety and accuracy demanded in today's work environment.